Add six Autobots to the Combiner Wars! All six figures merge to form Victorion - the first-ever Fan's Choice combiner team! Mix and match with your other favorite Combiner Wars toys, sold separately. This is what you want. This is what you get! Pyra Magna leads the Rust Renegades - a team of explorers who merge into Victorion when exposed to the mysterious, ancient Enigma of Combination. Her team includes Stormclash, Skyburst, Dustup, Jumpstream, and Rust Dust. Each individual figure in this boxed set includes a unique weapon, and those weapons can combine to form a giant super blade. Pyra Magna transforms into a fire truck, and leads the crew. Stormclash and Skyburst are the helicopter twins. Dustup is armed with a bladed weapon while she changes into a race car. Jumpstream turns into a supercar, and comes with a killer shield. Rounding out the set is the diminutive Rust Dust, a motorcycle who can merge with her crew to form the giant 12-inch tall Victorion! Individual robots measure from 4- to 7 1/2-inches tall. 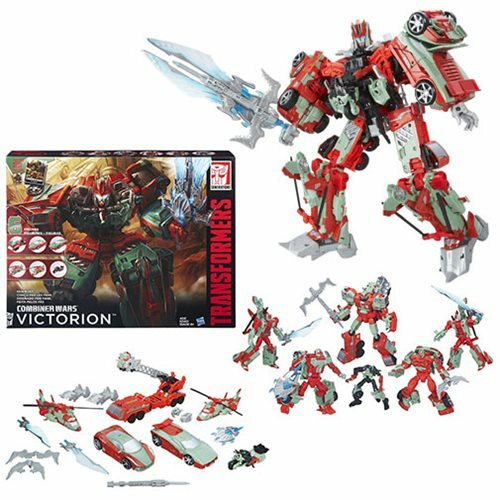 Includes 6 transforming robots which can merge to form one larger robot plus 9 accessories, 1 poster, and 1 trading card. Ages 8 and up.